WITH hundreds of nurses due to resume picketing all hospitals, health centres and intellectual disability services in Limerick from 8am this Thursday morning, hopes of a settlement to the INMO pay dispute seem some distance away. Pickets are scheduled for all six hospitals in the University of Limerick Hospitals Group from 8am to 4pm; at the Newcastle West and Kilmallock Health Centres from 9am to 4pm and at the Brothers of Charity Intellectual Disability Services in Foynes and Bawnmore from noon to to 2pm. Pickets at the Daughters of Charity service will be maintained from 8am to 4pm. 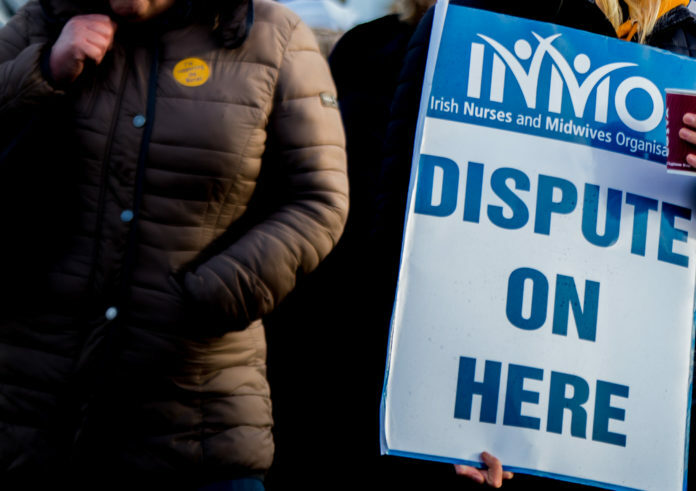 INMO General Secretary Phil Ni Sheaghdha said they had identified excessive costs and wastage in the HSE, which could be used to address the pay issues at the heart of the recruitment and retention crisis but the government would not listen. She maintained that none of these savings were included in the government’s €300 million cost estimate, which would automatically be reduced by 30 to 40 per cent due to income taxes. Meanwhile, the UL Hospitals Group said that Injury Units in Ennis, Nenagh and St John’s hospitals will be closed today but will reopen on Friday. “UL Hospitals continues to work with the INMO to secure the safest level of nursing and midwifery cover in our hospitals during the period of the strike and contingency arrangements are being finalised.